Colored lightmaps for Quake and it's official expansions Scourge of Armagon, and Dissolution of Eternity. Format: .PAK. Tested with: DirectQ v1.9.0. 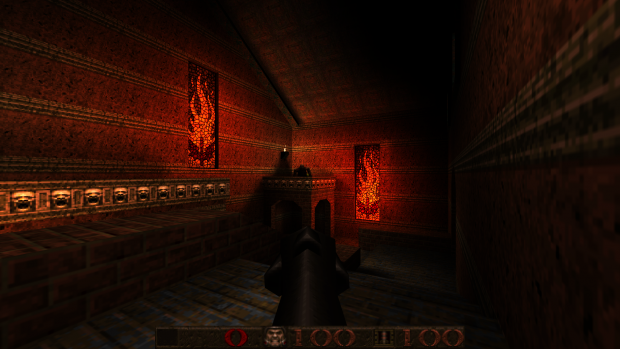 Also works with Jacques Krige's excellent Ultimate Quake Engine, as can be seen in the screenshot. Would this work with Quakespasm? How to turn this on in quakespasm? I am also curious on how to get it running in Quakespasm. What's with this file layout? A readme would've been nice. Take the LIGHTS.PAK file in the id1 folder and drop it into your quake\id1 folder. Then rename the file to 'PAK2.PAK' -- If you have more pack files just name it the next number in line.